Olaf Tryggveson also makes a great figure in the Faroeer Saga, and recounts there his early troubles, which were strange and many. He is still reckoned a grand hero of the North, though his vates now is only Snorro Sturrleson of Iceland. Tryggveson had indeed many adventures in the world. His poor mother, Astrid, was obliged to fly with him, on murder of her husband by Gunhild-to fly for life, three months before her little Olaf was born. She lay concealed in reedy island, fled through trackless forests, reached her father's with the little baby in her arms, and lay deep-hidden there; tended only by her father himself; Gunhild's pursuit being so incessant and keen as with sleuth-hounds. Poor Astrid had to fly again deviously to Sweden, to Esthland (Esthonia), to Russia. In Esthland she was sold as a slave, quite parted from her boy, who also was sold, and again sold; but did at last fall in with a kinsman high in the Russian service; did from him find redemption and help, and so rose, in a distinguished manner, to manhood, victorious self-help, and recovery of his kingdom at last. He even met his mother again, he as King of Norway, she as one wonderfully lifted out of darkness into new life, and happiness still in store. Grown to manhood, Tryggveson, now become acquainted with his birth, and with his, alas! hopeless claims, left Russia for the one profession open to him, that of sea-robbery; and did feats without number in that questionable line in many seas and scenes,-in England latterly, and most conspicuously of all. In one of his courses thither, after long labors in the Hebrides, Man, Wales, and down the western shores to the very Land's End and farther, he paused at the Scilly Islands for a little while. He was told of a wonderful Christian hermit living strangely in these sea-solitudes; had the curiosity to seek him out, examine, question, and discourse with him; and, after some reflection, accepted Christian baptism from the venerable man. In Snorro the story is involved in miracle, rumor, and fable; but the fact itself seems certain, and is very interesting; the great, wild, noble soul of fierce Olaf opening to this wonderful gospel of tidings from beyond the world, tidings which infinitely transcended all else he had ever heard or dreamt of! It seems certain he was baptized here; date not fixable; shortly before poor heart-broken Dunstan's death, or shortly after; most English churches, monasteries especially, lying burnt, under continual visitation of the Danes. Olaf, such baptism notwithstanding, did not quit his viking profession; indeed, what other was there for him in the world as yet? We mentioned his occasional copartneries with Svein of the Double-beard, now become King of Denmark, but the greatest of these, and the alone interesting at this time, is their joint invasion of England, and Tryggveson's exploits and fortunes there some years after that adventure of baptism in the Scilly Isles. Svein and he "were above a year in England together," this time: they steered up the Thames with three hundred ships and many fighters; siege, or at least furious assault, of London was their first or main enterprise, but it did not succeed. The "Saxon Chronicle" gives date to it, A.D. 994, and names expressly, as Svein's copartner, "Olaus, King of Norway,"-which he was as yet far from being; but in regard to the Year of Grace the "Saxon Chronicle" is to be held indisputable, and, indeed, has the field to itself in this matter. But finding London impregnable for the moment (no ship able to get athwart the bridge, and many Danes perishing in the attempt to do it by swimming), Svein and Olaf turned to other enterprises; all England in a manner lying open to them, turn which way they liked. They burnt and plundered over Kent, over Hampshire, Sussex; they stormed far and wide; world lying all before them where to choose. Wretched Ethelred, as the one invention he could fall upon, offered them Danegelt (#16,000 of silver this year, but it rose in other years as high as #48,000); the desperate Ethelred, a clear method of quenching fire by pouring oil on it! Svein and Olaf accepted; withdrew to Southampton-Olaf at least did-till the money was got ready. Strange to think of, fierce Svein of the Double-beard, and conquest of England by him; this had at last become the one salutary result which remained for that distracted, down-trodden, now utterly chaotic and anarchic country. A conquering Svein, followed by an ably and earnestly administrative, as well as conquering, Knut (whom Dahlmann compares to Charlemagne), were thus by the mysterious destinies appointed the effective saviours of England. Tryggveson, on this occasion, was a good while at Southampton; and roamed extensively about, easily victorious over everything, if resistance were attempted, but finding little or none; and acting now in a peaceable or even friendly capacity. In the Southampton country he came in contact with the then Bishop of Winchester, afterward Archbishop of Canterbury, excellent Elphegus, still dimly decipherable to us as a man of great natural discernment, piety, and inborn veracity; a hero-soul, probably of real brotherhood with Olaf's own. He even made court visits to King Ethelred; one visit to him at Andover of a very serious nature. By Elphegus, as we can discover, he was introduced into the real depths of the Christian faith. Elphegus, with due solemnity of apparatus, in presence of the king, at Andover baptized Olaf anew, and to him Olaf engaged that he would never plunder in England any more; which promise, too, he kept. In fact, not long after, Svein's conquest of England being in an evidently forward state, Tryggveson (having made, withal, a great English or Irish marriage,-a dowager princess, who had voluntarily fallen in love with him,-see Snorro for this fine romantic fact!) mainly resided in our island for two or three years, or else in Dublin, in the precincts of the Danish Court there in the Sister Isle. Accordingly it was in Dublin, as above noted, that Hakon's spy found him; and from the Liffey that his squadron sailed, through the Hebrides, through the Orkneys, plundering and baptizing in their strange way, toward such success as we have seen. A Norse raid under Olaf. At one of his first Things he found the Bonders all assembled in arms; resolute to the death seemingly, against his proposal and him. Tryggveson said little; waited impassive, "What your reasons are, good men?" One zealous Bonder started up in passionate parliamentary eloquence; but after a sentence or two broke down; one, and then another, and still another, and remained all three staring in open-mouthed silence there! The peasant-proprietors accepted the phenomenon as ludicrous, perhaps partly as miraculous withal, and consented to baptism this time. On another occasion of a Thing, which had assembled near some heathen temple to meet him,-temple where Hakon Jarl had done much repairing, and set up many idol figures and sumptuous ornaments, regardless of expense, especially a very big and splendid Thor, with massive gold collar round the neck of him, not the like of it in Norway,-King Tryggveson was clamorously invited by the Bonders to step in there, enlighten his eyes, and partake of the sacred rites. Instead of which he rushed into the temple with his armed men; smashed down, with his own battle-axe, the god Thor prostrate on the floor at one stroke, to set an example; and in a few minutes had the whole Hakon Pantheon wrecked; packing up, meanwhile, all the gold and preciosities accumulated there (not forgetting Thor's illustrious gold collar, of which we shall hear again), and victoriously took the plunder home with him for his own royal uses and behoof of the state. By unwearied industry of this and better kinds, Tryggveson had trampled down idolatry, so far as form went,-how far in substance may be greatly doubted. But it is to be remembered withal, that always on the back of these compulsory adventures there followed English bishops, priests, and preachers; whereby to the open-minded, conviction, to all degrees of it, was attainable, while silence and passivity became the duty or necessity of the unconvinced party. In about two years Norway was all gone over with a rough harrow of conversion. Heathenism at least constrained to be silent and outwardly conformable. Tryggveson next turned his attention to Iceland, sent one Thangbrand, priest from Saxony, of wonderful qualities, military, as well as theological, to try and convert Iceland. Thangbrand made a few converts; for Olaf had already many estimable Iceland friends, whom he liked much, and was much liked by; and conversion was the ready road to his favor. Thangbrand, I find, lodged with Hall of Sida (familiar acquaintance of "Burnt Njal," whose Saga has its admirers among us even now). Thangbrand converted Hall and one or two other leading men; but in general he was reckoned quarrelsome and blusterous rather than eloquent and piously convincing. Two skalds of repute made biting lampoons upon Thangbrand, whom Thangbrand, by two opportunities that offered, cut down and did to death because of their skaldic quality. Another he killed with his own hand, I know not for what reason. In brief, after about a year, Thangbrand returned to Norway and King Olaf, declaring the Icelanders to be a perverse, satirical, and inconvertible people, having himself, the record says, been "the death of three men there." King Olaf was in high rage at this result; but was persuaded by the Icelanders about him to try farther, and by a milder instrument. He accordingly chose one Thormod, a pious, patient, and kindly man, who, within the next year or so, did actually accomplish the matter; namely, get Christianity, by open vote, declared at Thingvalla by the general Thing of Iceland there; the roar of a volcanic eruption at the right moment rather helping the conclusion, if I recollect. Whereupon Olaf's joy was no doubt great. One general result of these successful operations was the discontent, to all manner of degrees, on the part of many Norse individuals, against this glorious and victorious, but peremptory and terrible king of theirs. Tryggveson, I fancy, did not much regard all that; a man of joyful, cheery temper, habitually contemptuous of danger. Another trivial misfortune that befell in these conversion operations, and became important to him, he did not even know of, and would have much despised if he had. It was this: Sigrid, queen-dowager of Sweden, thought to be among the most shining women of the world, was also known for one of the most imperious, revengeful, and relentless, and had got for herself the name of Sigrid the Proud. In her high widowhood she had naturally many wooers; but treated them in a manner unexampled. In spite of which, however, there went from Tryggveson, who was now a widower, some incipient marriage proposals to this proud widow; by whom they were favorably received; as from the brightest man in all the world, they might seem worth being. Now, in one of these anti-heathen onslaughts of King Olaf's on the idol temples of Hakon-(I think it was that case where Olaf's own battle-axe struck down the monstrous refulgent Thor, and conquered an immense gold ring from the neck of him, or from the door of his temple)-a huge gold ring, at any rate, had come into Olaf's hands; and this he bethought him might be a pretty present to Queen Sigrid, the now favorable, though the proud. Sigrid received the ring with joy; fancied what a collar it would make for her own fair neck; but noticed that her two goldsmiths, weighing it on their fingers, exchanged a glance. "What is that?" exclaimed Queen Sigrid. "Nothing," answered they, or endeavored to answer, dreading mischief. But Sigrid compelled them to break open the ring; and there was found, all along the inside of it, an occult ring of copper, not a heart of gold at all! "Ha," said the proud queen, flinging it away, "he that could deceive in this matter can deceive in many others!" And was in hot wrath with Olaf; though, by degrees, again she took milder thoughts. Milder thoughts, we say; and consented to a meeting next autumn at some half-way station, where their great business might be brought to a happy settlement and betrothment. Both Olaf Tryggveson and the high dowager appear to have been tolerably of willing mind at this meeting; but Olaf interposed, what was always one condition with him, "Thou must consent to baptism, and give up thy idol-gods." "They are the gods of all my forefathers," answered the lady; "choose thou what gods thou pleasest, but leave me mine." Whereupon an altercation; and Tryggveson, as was his wont, towered up into shining wrath, and exclaimed at last, "Why should I care about thee then, old faded heathen creature?" And impatiently wagging his glove, hit her, or slightly switched her, on the face with it, and contemptuously turning away, walked out of the adventure. "This is a feat that may cost thee dear one day," said Sigrid. And in the end it came to do so, little as the magnificent Olaf deigned to think of it at the moment. Olaf Tryggveson, though his kingdom was the smallest of the Norse Three, had risen to a renown over all the Norse world which neither he of Denmark nor he of Sweden could pretend to rival. A magnificent, far-shining man; more expert in all "bodily exercises," as the Norse called them, than any man had ever been before him, or after was. Could keep five daggers in the air, always catching the proper fifth by its handle, and sending it aloft again; could shoot supremely, throw a javelin with either hand; and, in fact, in battle usually threw two together. These, with swimming, climbing, leaping, were the then admirable Fine Arts of the North; in all which Tryggveson appears to have been the Raphael and the Michael Angelo at once. Essentially definable, too, if we look well into him, as a wild bit of real heroism, in such rude guise and environment; a high, true, and great human soul. A jovial burst of laughter in him, too; a bright, airy, wise way of speech; dressed beautifully and with care; a man admired and loved exceedingly by those he liked; dreaded as death by those he did not like. "Hardly any king," says Snorro, "was ever so well obeyed, by one class out of zeal and love, by the rest out of dread." His glorious course, however, was not to last long. King Svein of the Double-beard had not yet completed his conquest of England,-by no means yet, some thirteen horrid years of that still before him!-when, over in Denmark, he found that complaints against him and intricacies had arisen, on the part principally of one Burislav, King of the Wends (far up the Baltic), and in a less degree with the King of Sweden and other minor individuals. Svein earnestly applied himself to settle these, and have his hands free. Burislav, an aged heathen gentleman, proved reasonable and conciliatory; so, too, the King of Sweden, and Dowager Queen Sigrid, his managing mother. Bargain in both these cases got sealed and crowned by marriage. Svein, who had become a widower lately, now wedded Sigrid; and might think, possibly enough, he had got a proud bargain, though a heathen one. Burislav also insisted on marriage with Princess Thyri, the Double-beard's sister. Thyri, inexpressibly disinclined to wed an aged heathen of that stamp, pleaded hard with her brother; but the Double-bearded was inexorable; Thyri's wailings and entreaties went for nothing. With some guardian foster-brother, and a serving-maid or two, she had to go on this hated journey. Old Burislav, at sight of her, blazed out into marriage feast of supreme magnificence, and was charmed to see her, but Thyri would not join the marriage party, refused to eat with it or sit with it at all. Day after day, for six days, flatly refused; and after nightfall of the sixth, glided out with her foster-brother into the woods, into by-paths and inconceivable wanderings; and, in effect, got home to Denmark. Brother Svein was not for the moment there; probably enough gone to England again. But Thyri knew too well he would not allow her to stay here, or anywhere that he could help, except with the old heathen she had just fled from. Thyri, looking round the world, saw no likely road for her, but to Olaf Tryggveson in Norway; to beg protection from the most heroic man she knew of in the world. Olaf, except by renown, was not known to her; but by renown he well was. Olaf, at sight of her, promised protection and asylum against all mortals. Nay, in discoursing with Thyri Olaf perceived more and more clearly what a fine handsome being, soul and body, Thyri was; and in a short space of time winded up by proposing to Thyri, who, humbly, and we may fancy with what secret joy, consented to say yes, and become Queen of Norway. In the due months they had a little son, Harald; who, it is credibly recorded, was the joy of both his parents; but who, to their inexpressible sorrow, in about a year died, and vanished from them. This, and one other fact now to be mentioned, is all the wedded history we have of Thyri. The other fact is, that Thyri had, by inheritance or covenant, not depending on her marriage with old Burislav, considerable properties in Wendland, which she often reflected might be not a little behooveful to her here in Norway, where her civil-list was probably but straitened. She spoke of this to her husband; but her husband would take no hold, merely made her gifts, and said, "Pooh, pooh, can't we live without old Burislav and his Wendland properties?" So that the lady sank into ever deeper anxiety and eagerness about this Wendland object; took to weeping; sat weeping whole days; and when Olaf asked, "What ails thee, then?" would answer, or did answer once, "What a different man my father Harald Gormson was" (vulgarly called Blue-tooth), "compared with some that are now kings! For no King Svein in the world would Harald Gormson have given up his own or his wife's just rights!" Whereupon Tryggveson started up, exclaiming, in some heat, "Of thy brother Svein I never was afraid; if Svein and I meet in contest, it will not be Svein, I believe, that conquers;" and went off in a towering fume. Consented, however, at last, had to consent, to get his fine fleet equipped and armed, and decide to sail with it to Wendland to have speech and settlement with King Burislav. Tryggveson had already ships and navies that were the wonder of the North. Especially in building war-ships-the Crane, the Serpent, last of all the Long Serpent-he had, for size, for outward beauty, and inward perfection of equipment, transcended all example. This new sea expedition became an object of attention to all neighbors; especially Queen Sigrid the Proud and Svein Forkbeard, her now king, were attentive to it. By such persuasions, and reiterations, King Svein of Denmark, King Olaf of Sweden, and Jarl Eric, now a great man there, grown rich by prosperous sea-robbery and other good management, were brought to take the matter up, and combine strenuously for destruction of King Olaf Tryggveson on this grand Wendland expedition of his. Fleets and forces were with best diligence got ready; and, withal, a certain Jarl Sigwald of Jomsburg, chieftain of the Jomsvikings, a powerful, plausible, and cunning man, was appointed to find means of joining himself to Tryggveson's grand voyage; of getting into Tryggveson's confidence, and keeping Svein Forkbeard, Eric, and the Swedish king aware of all his movements. King Olaf Tryggveson, unacquainted with all this, sailed away in summer, with his splendid fleet; went through the Belts with prosperous winds, under bright skies, to the admiration of both shores. Such a fleet, with its shining Serpents, long and short, and perfection of equipment and appearance, the Baltic never saw before. Jarl Sigwald joined with new ships by the way. "Had," he too, "a visit to King Burislav to pay; how could he ever do it in better company?" and studiously and skilfully ingratiated himself with King Olaf. Old Burislav, when they arrived, proved altogether courteous, handsome, and amenable; agreed at once to Olaf's claims for his now queen, did the rites of hospitality with a generous plenitude to Olaf; who cheerily renewed acquaintance with that country, known to him in early days (the cradle of his fortunes in the viking line), and found old friends there still surviving, joyful to meet him again. Jarl Sigwald encouraged these delays, King Svein and Co. not being yet quite ready. "Get ready!" Sigwald directed them, and they diligently did. Olaf's men their business now done, were impatient to be home, and grudged every day of loitering there; but, till Sigwald pleased, such his power of flattering and cajoling Tryggveson, they could not get away. At length, Sigwald's secret messengers reporting all ready on the part of Svein and Co., Olaf took farewell of Burislav and Wendland, and all gladly sailed away. Svein, Eric, and the Swedish king, with their combined fleets, lay in wait behind some cape in a safe little bay of some island, then called Svolde, but not in our time to be found: the Baltic tumults in the fourteenth century having swallowed it, as some think, and leaving us uncertain whether it was in the neighborhood of Rugen Island or in the Sound of Elsinore. There lay Svein, Eric and Co. waiting till Tryggveson and his fleet came up, Sigwald's spy messengers daily reporting what progress he and it had made. At length, one bright summer morning, the fleet made appearance, sailing in loose order, Sigwald, as one acquainted with the shoal places, steering ahead, and showing them the way. Snorro rises into one of his pictorial fits, seized with enthusiasm at the thought of such a fleet, and reports to us largely in what order Tryggveson's winged Coursers of the Deep, in long series, for perhaps an hour or more, came on, and what the three potentates, from their knoll of vantage, said of each as it hove in sight. Svein thrice over guessed this and the other noble vessel to be the Long Serpent; Eric always correcting him: "No, that is not the Long Serpent yet" (and aside always), "Nor shall you be lord of it, King, when it does come." The Long Serpent itself did make appearance. 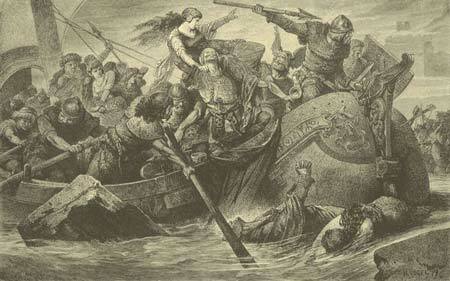 Eric, Svein, and the Swedish king hurried on board, and pushed out of their hiding-place into the open sea. Treacherous Sigwald, at the beginning of all this, had suddenly doubled that cape of theirs, and struck into the bay out of sight, leaving the foremost Tryggveson ships astonished, and uncertain what to do, if it were not simply to strike sail and wait till Olaf himself with the Long Serpent arrived. Olaf's chief captains, seeing the enemy's huge fleet come out, and how the matter lay, strongly advised King Olaf to elude this stroke of treachery, and, with all sail, hold on his course, fight being now on so unequal terms. Snorro says, the king, high on the quarter-deck where he stood, replied, "Strike the sails! never shall men of mine think of flight. I never fled from battle. Let God dispose of my life; but flight I will never take." And so the battle arrangements immediately began, and the battle with all fury went loose, and lasted hour after hour, till almost sunset, if I well recollect. "Olaf stood on the Serpent's quarter-deck," says Snorro, "high over the others. He had a gilt shield and a helmet inlaid with gold; over his armor he had a short red coat, and was easily distinguished from other men." Snorro's account of the battle is altogether animated, graphic, and so minute that antiquaries gather from it, if so disposed (which we but little are), what the methods of Norse sea-fighting were; their shooting of arrows, casting of javelins, pitching of big stones, ultimately boarding, and mutual clashing and smashing, which it would not avail us to speak of here. Olaf stood conspicuous all day, throwing javelins, of deadly aim, with both hands at once; encouraging, fighting, and commanding like a highest sea-king. The Danish fleet, the Swedish fleet, were, both of them, quickly dealt with, and successively withdrew out of shot-range. And then Jarl Eric came up, and fiercely grappled with the Long Serpent, or, rather, with her surrounding comrades; and gradually, as they were beaten empty of men, with the Long Serpent herself. The fight grew ever fiercer, more furious. Eric was supplied with new men from the Swedes and Danes; Olaf had no such resource, except from the crews of his own beaten ships; and at length this also failed him; all his ships, except the Long Serpent, being beaten and emptied. Olaf fought on unyielding. Eric twice boarded him, was twice repulsed. Olaf kept his quarter-deck; unconquerable, though left now more and more hopeless, fatally short of help. A tall young man, called Einar Tamberskelver, very celebrated and important afterward in Norway, and already the best archer known, kept busy with his bow. Twice he nearly shot Jarl Eric in his ship. "Shoot me that man," said Jarl Eric to a bowman near him; and, just as Tamberskelver was drawing his bow the third time, an arrow hit it in the middle and broke it in two. "What is this that has broken?" asked King Olaf. "Norway from thy hand, King," answered Tamberskelver. Tryggveson's men, he observed with surprise, were striking violently on Eric's; but to no purpose; nobody fell. "How is this?" asked Tryggveson. "Our swords are notched and blunted, King; they do not cut." Olaf stept down to his arm-chest; delivered out new swords; and it was observed as he did it, blood ran trickling from his wrist; but none knew where the wound was. Eric boarded a third time. Olaf, left with hardly more than one man, sprang overboard (one sees that red coat of his still glancing in the evening sun), and sank in the deep waters to his long rest. Rumor ran among his people that he still was not dead; grounding on some movement by the ships of that traitorous Sigwald, they fancied Olaf had dived beneath the keels of his enemies, and got away with Sigwald, as Sigwald himself evidently did. "Much was hoped, supposed, spoken," says one old mourning Skald; "but the truth was, Olaf Tryggveson was never seen in Norseland more." Strangely he remains still a shining figure to us; the wildly beautifullest man, in body and in soul, that one has ever heard of in the North.